In many households, including mine olive oil is considered a food staple. But did you know that this oil contains health benefits as well as uses from personal care, green cleaning, home improvement as well as others. Important: Do not store olive oil in direct heat or light. Storing the product this way can damage to the oil by creating oxidation, resulting in the change of beneficial chemical compounds. It is best to store it either in a room temperature cupboard or refrigerator to keep it cool. While there are many ways to use olive oil, I have only included a list of what I have personally tried and know truly works. As I try more uses I will update as I go. Hair - comb a little through dry or frizzy hair for to help ease and moisturize. Perfect in winter or on humid days. Lips - Apply a little to dry lips before going outside in winter. Skin - Apply it directly to act as a moisturizer to fight dryness. - Add two or three tablespoons to a warm bath to give your skin a good healthy soak. Add some essential oil for an added scent. Nails - Moisturize cuticles by applying a small amount to the nail beds. Feet - For dry and cracked skin rub olive oil over feet and then cover them up with socks and leave on overnight. Furniture polish - Combine 1/2 cup olive oil and 1/4 cup lemon juice in a bottle. Share bottle prior to each use to recombine the ingredients. Wipes away dust effectively and leaves a nice shine behind. Lubricant - Works as an alternative to WD-40. For instance it is just as effective at fixing a squeaky door as WD-40. - Lubricate measuring spoons and cups when using sticky substances such as honey and sugar syrup. - Free a stuck zipper. Use a Q-tip or cotton swab and apply oil to the top of the zipper. Then ease the tab down gently. - Rub a thin coat on the base of the holder prior to inserting a candle. Dripped wax should peel away easily. Shoe polish - Rub in and leave for 30 minutes. Then wipe off any excess. I knew olive oil was good for you but I did not know of all these other uses. Thank you for the tip. Just followed you via G+ and Twitter. Looking forward to reading your blog as well. Olive oil is sooo good for you! I have slightly high cholesterol so I make sure to cook with it a lot to help lower it down. It's a wonder oil! Thank you for stopping by! Sorry to hear that you have trouble with your cholesterol. 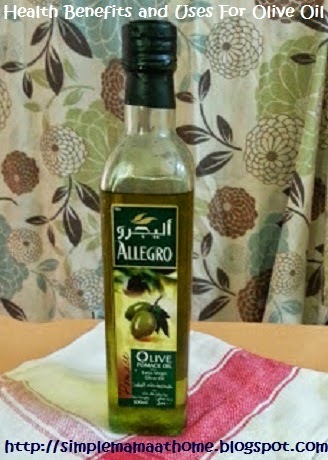 It is great that we have substitutes such as olive oil in times like these. I should totally use this for more than just cooking.Thanks for sharing! Thank you for stopping by! I have only recently started using olive oil for alternatives to other things. I was very surprised with the results. It truly is amazing!